The kids and I were ready for the schedule to resume after the festivities of the holiday break. Though, we did put those long winter days to very good use: we learned how to make pasta as a family. Growing up, I remember my grandma making wide egg noodles that she used in a variety of recipes. My parents also made homemade fettuccine that I fondly remember drying everywhere in the house the few times we made it. Since my kids are always my best sous chefs, pasta is surprisingly easy, and I wanted them to have those memories, we undertook the challenge together. One of the things that I love about fresh pasta is that handmade is bestmade. Like soap, it’s also a transformation of simple ingredients that creates something that is a crowd pleaser. 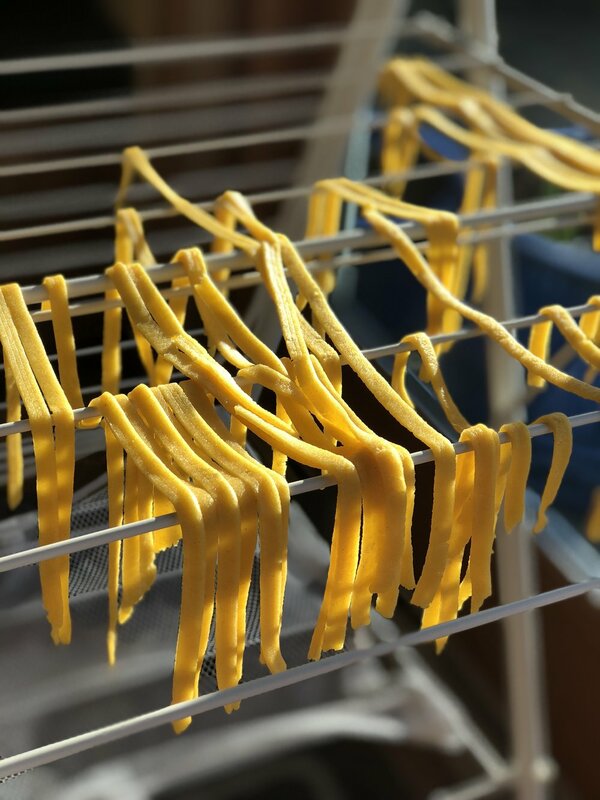 Homemade pasta is also radically different than store-bought pasta which tends to be water + flour to make it shelf stable. Homemade pasta can be chewy, nutritionally dense and is the star of the show. The kids took to making pasta quickly. Our six year old has even progressed to ravioli and the four year old warned her Dad to “Stay back. You’re in my pasta business!” when he got too close to her cutting her fettuccine noodles. Like her brother, she has some entrepreneurial tendencies. Jamisen has been selling bath fizzies at the farmer’s market this summer. It’s been a great experience for him to learn patience, customer service and a bit about a profit and loss statement, since he has to pay his booth entry fee and his cost of goods sold himself. He hired his sister to watch the booth while he took breaks this summer, but it sure seems like she’d like to branch out on her own with pasta. Who knows; maybe they’ll have side-by-side kiddo stands this summer. That could be really fun. Lest you harbor any illusions that pasta making is sooooo easy that anyone can do it on the first try, it does take wee bit of art as well as science because the actual dough process goes a bit by feel. Every book and video out there has a slightly different take on the right amount of moisture for the type of flour you’re using and if olive oil is necessary or not. My personal preference? Say ‘yes’ to the olive oil. It makes the dough way easier to wrestle. Even with guidelines (1 Tablespoon Olive oil, 3 eggs to 2 cups of flour + ½ tsp of salt), there is still definitely a hand “feel” that you’re going for as you roll out the dough. The hardest part for me in learning to make pasta was to be patient enough to knead the dough for the full amount of time allotted. The second hardest part? Not eating allllll the dough before it was cooked. Raw pasta dough is delicious! One of the reasons I do so many activities with the kids at home is because I believe that creativity is essential and I want to instill that in them as well. Even though they both have very unique personalities, that quality time with me and the act of creation really seems to appeal to both of them. Have you tried making pasta? What did you think? I’d love to get any tips and tricks you have. I’m trying to master ravioli next!